An amazing, deeply flavored, big steaming hot bowl of chili! And you won't believe how simple this is to make. 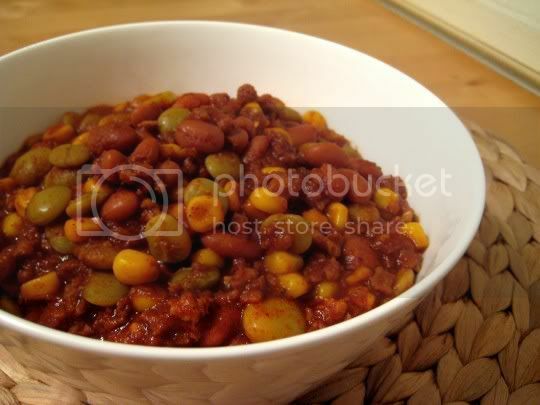 Simply combine salsa (the pureed kind, not the chunky kind), beans, frozen corn and lima beans, soy ground beef, and a bunch of chili powder...and you've got a meal that tastes ingredient-heavy and super complicated. This is probably best cooked in a slow cooker (as the recipe suggests) so you don't have to remember to stir it every so often for 1 1/2 to 2 hours...but I don't have a slow cooker, so my regular 4-quart pot did just fine. I also think any meat-eater would be fooled when trying this: the soy crumbles are the perfect texture, and they really soak up the tomato and chili powder flavors. I used a medium salsa, and pepper and hot sauce are also added to the chili, so this dish does pack some moderate heat. But it's the good chili kind of heat, plus everything else you want: tangy, spicy, hearty...and even better, healthy! Low fat and packed with protein, who could ask for more? The recipe suggests garnishing with diced avocado and red onion (which I omitted from the pic), but anything else would be wonderful: tomatoes, sour cream, cheese, you name it. Make again? Definitely. Standard ingredients and a cinch to make...this is the perfect meal you want to make for the start of the week and keep eating the leftovers. And you'd better have the cornbread on the side!